Hiden Isochema’s IGAsorp dynamic vapor sorption (DVS) analyzer is now available with a video microscope for high resolution in situ image capture between 5 and 350 °C. This option facilitates the study of phase changes in precisely controlled thermal ramp or steady state conditions including dehydration-rehydration and deliquescence. The IGAsorp’s camera option allows simultaneous high resolution image collection with vapor sorption and TGA measurements to 350 °C, and is compatible with both water and organic vapors. The high resolution video microscope features LED illumination, adjustable magnification to 220x and a built-in polarizer. An all-new software interface offers complete control of the camera from the IGAsorp software with full colour images recorded either at defined time intervals or at particular stages in the method. Real time image display is integrated with the gravimetric data and replay options include time lapse video presentation mode. 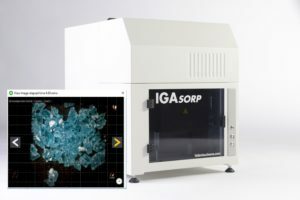 The IGAsorp is a fully automated compact benchtop DVS analyzer measuring vapor sorption isotherms, kinetics and thermal desorption properties of materials. IGAsorp instruments offer market leading performance with unrivalled weighing stability, temperature and humidity control, and offer fast and accurate sorption analysis. The IGAsorp is available with a range of options and accessories. This includes: organic vapor measurement capability, moisture vapor transmission rate (MVTR) cell, technique hyphenation with complementary characterization tools and Hiden Analytical quadrupole mass spectrometers. All IGAsorp instruments are supplied with Hiden Isochema’s advanced HIsorp software and a 3 year warranty.